TandemEyes is a cycling club for people with vision loss. 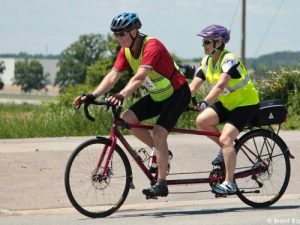 We provide the tandem bikes (bicycles built for two) and training for all captains (experienced cyclist on the front of the bike) and stokers (person with vision loss on the back of the bike). We need people to captain our tandems on Monday and/or Wednesday evenings from early May to the end of August 2017. We also need cyclists on single bikes to lead our group rides. If you are interested in volunteering as a captain or group leader please visit our website at www.tandemeyes.com for more information and call Anne Wood at 705-741-3406.